Tropical Cyclone Kenanga is now on a weakening trend and NASA’s GPM core satellite provided a look at the rainfall and cloud heights within the storm. On December 20, 2018, NASA’s Global Precipitation Measurement mission or GPM core observatory satellite passed over the Tropical Cyclone Kenanga and captured the storm beginning to weaken as predicted. The GPM satellite had an excellent view of the Kenanga when the tropical cyclone’s maximum sustained winds were at 90 knots (103.5 mph). 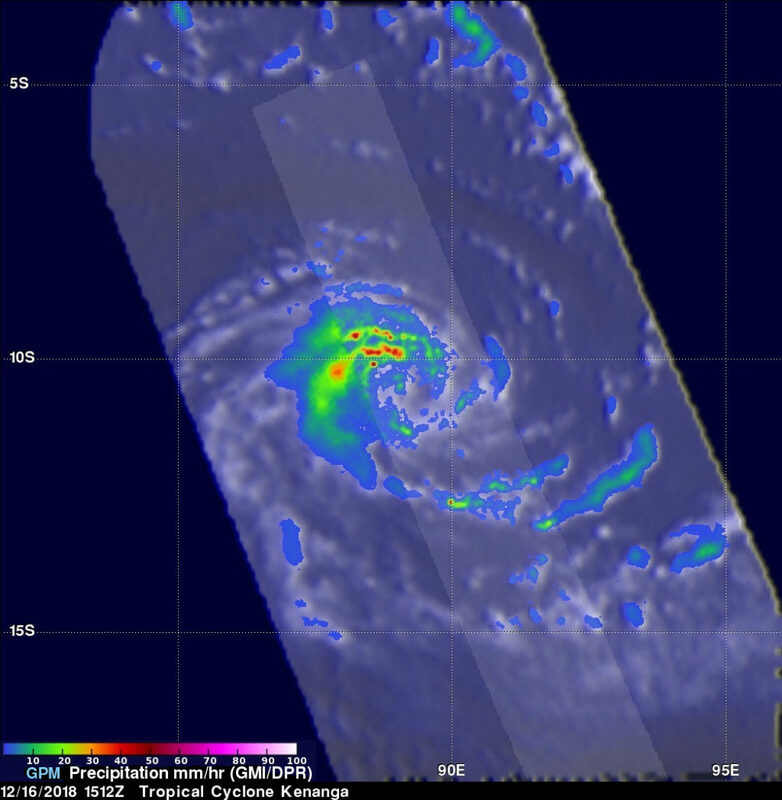 GPM’s pass showed the eye of the storm, visible the day before, had since filled in. GPM’s instruments including the Microwave Imager (GMI) and the Dual-Frequency Precipitation Radar (DPR) revealed that the powerful storms south of Kenanga’s center are still producing very heavy rainfall at the rate of 214 mm (8.4 inches) per hour in that area. The rainfall in the northern half of the storm had decreased significantly. This GPM 3-D view of Kenanga is looking southwest and was derived by the DPR Ku Band of the radar on the satellite. It showed extremely powerful storms south of Kenanga’s deteriorating eye were returning very strong reflectivity values which help to map the severity of the storm and the rainfall totals. The storm tops of the eyewall which had remained intact on the western side of the cyclone were reaching heights of 12.7 km (7.9 miles). On Dec. 21 at 10 a.m. EST (1500 UTC) Tropical Cyclone Kenanga was located approximately 672 nautical miles southeast of Diego Garcia and has tracked westward. Maximum sustained winds dropped to 60 knots (69 mpg/111 kph), so it is now a tropical storm. The Joint Typhoon Warning Center predicts that Kenanga will continue to weaken rapidly as the dry air within the storm gets colder and heavier causing downdrafts. It is the dry air higher aloft that contributes to stronger convective wind gusts and therefore stronger storms. Kenanga is forecast to dissipate in the next 72 hours as it tracks within the northeast periphery of Tropical Cyclone Cilida. The Southern Indian Ocean is seeing double. 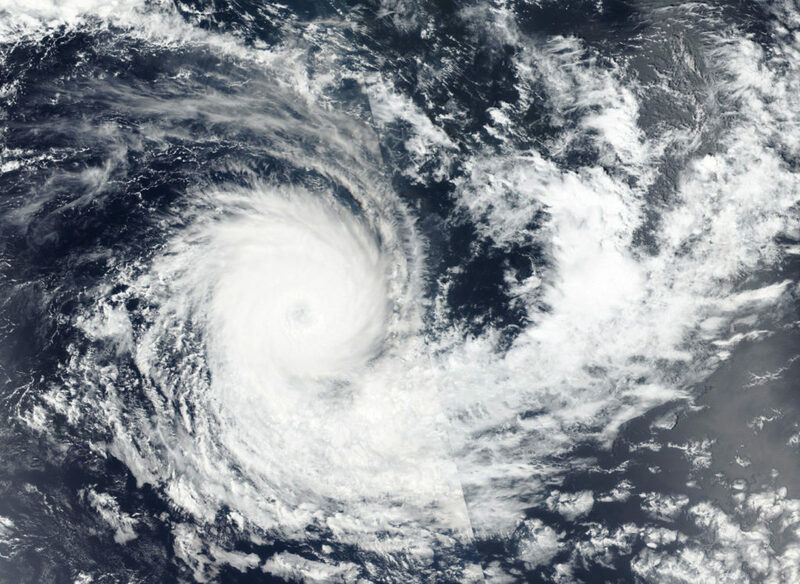 Tropical Cyclone Kenanga was one of two storms at Category 2 hurricane strength in the Southern Indian Ocean on Dec. 20. Kenanga was sporting an eye on visible imagery from NASA-NOAA’s Suomi NPP satellite, and so was Tropical Cyclone Cilida, located west of Kenanga. On Dec. 20, 2018 the Visible Infrared Imaging Radiometer Suite (VIIRS) instrument aboard NASA-NOAA’s Suomi NPP satellite showed a powerful thunderstorms circling Kenanga’s eye. The Joint Typhoon Warning Center or JTWC noted that after the Suomi NPP image was taken, infrared imagery showed the loss of the eye and the erosion of the eyewall (powerful thunderstorms circling the open center). Kenanga and Cilida are both Category 2 hurricanes on the Saffir-Simpson Hurricane Wind Scale, and both have maximum sustained winds near 90 knots (103.6 mph/166.7 kph) on Dec. 20 at 10 a.m. EDT (1500 UTC). Strongest storms appeared northwest of the eye. Kenanga was located near 16.6 degrees south latitude and 81.2 degrees east longitude, approximately 773 nautical miles southeast of Diego Garcia. Kenanga was moving west. The JTWC forecast calls for Kenanga to steadily weaken, and that will continue under the ongoing influence of moderate to strong vertical wind shear and passage over cooler water. The storm is expected to dissipate below 35 knots (40 mph/74 kph) in 5 days. NASA found very cold cloud top temperatures within the Southern Indian Ocean’s Tropical Cyclone Kenanga that indicate powerful thunderstorms reaching high into the troposphere. Those storms were generating very heavy rainfall as confirmed by the Global Precipitation Measurement mission or GPM core satellite. 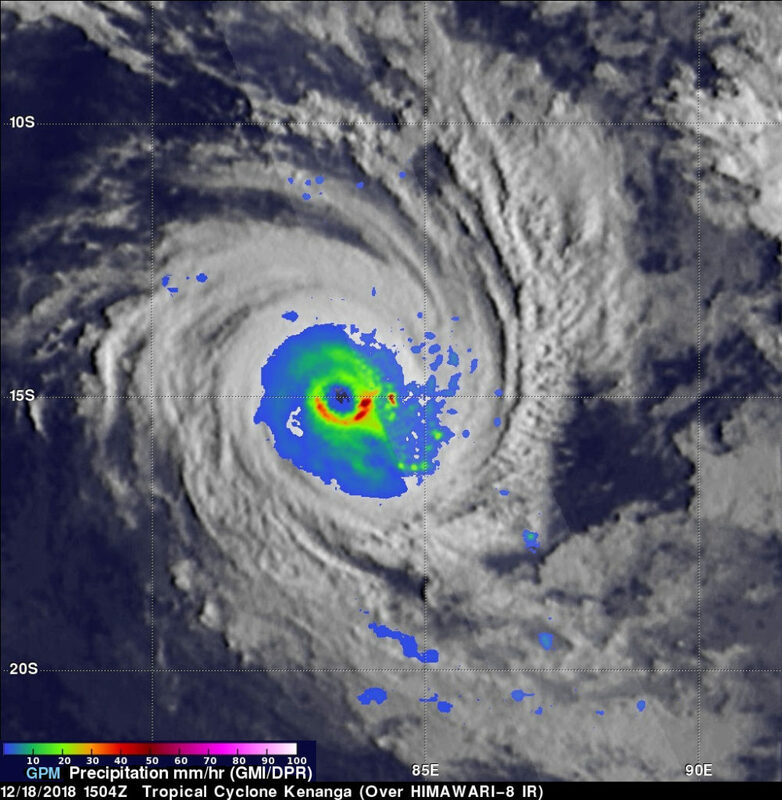 On December 18, 2018 at 10:04 a.m. EST (1504 UTC) the GPM core observatory satellite flew above powerful Tropical Cyclone Kenanga in the southwestern Indian Ocean. Tropical Cyclone Kenanga’s most distinctive feature was its large eye. At the time of the GPM pass Kenanga’s maximum sustained wind speeds were about 90 knots (104 mph). At NASA’s Goddard Space Flight Center in Greenbelt, Maryland, an analysis of the tropical cyclone’s rainfall was derived from data collected by GPM’s Microwave Imager (GMI) and GPM’s Dual-Frequency Precipitation Radar (DPR) instruments. GPM clearly showed the extreme rainfall in Kenanga’s well-defined circular eyewall. The heaviest rainfall was found by GPM in the tropical cyclone’s southeastern quadrant. GPM’s radar (DPR Ku Band) measured precipitation there falling at a rate of over 161 mm (6.3 inches) per hour on that side of the tropical cyclone. A 3-D view of the storm was created at Goddard that showed the estimated relative heights of storms within tropical cyclone Kenanga. Those heights are based on measurements by the GPM satellite’s radar (DPR Ku Band) blended with estimates from Japan’s HIMAWARI-8 satellite’s infrared temperatures. GPM’s radar probes of Kenanga’s eastern side indicated that storm tops in that part of the tropical cyclone were reaching heights above 12.2 km (7.6 miles). GPM is a joint mission between NASA and the Japan Aerospace Exploration Agency, JAXA. 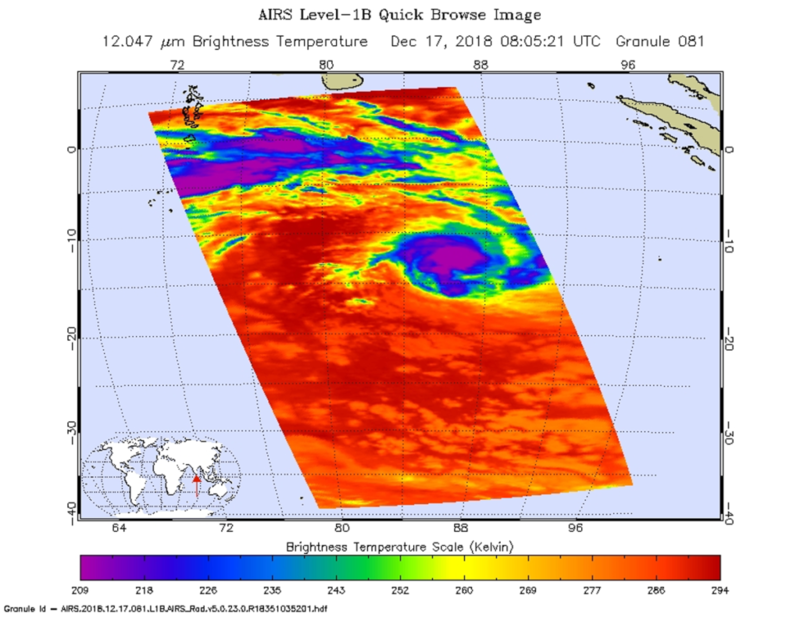 On Dec. 19 at 2:53 a.m. EST (0753 UTC) the Atmospheric Infrared Sounder or AIRS instrument aboard NASA’s Aqua satellite captured temperature data from Tropical Cyclone Kenanga, using infrared light. The most powerful storms, with coldest cloud top temperatures appeared around the eye and were colder than minus 63 degrees Fahrenheit (minus 53 degrees Celsius). Satellite data showed that the eye is about 25 nautical miles in diameter and that the southern side of the storm appeared to be elongating, a sign of weakening. On Dec. 19 at 10 a.m. EST (1500 UTC), Kenanga’s wind speeds peaked at about 115 knots (132 mph/213 kph). It was centered near 16.6 degrees south latitude and 82.1 degrees east longitude. That’s approximately 805 nautical miles southeast of Diego Garcia. Kenanga has tracked southwestward. Kenanga is now expected to gradually weaken as the tropical cyclone moves toward the southwest over progressively cooler sea surface temperature. 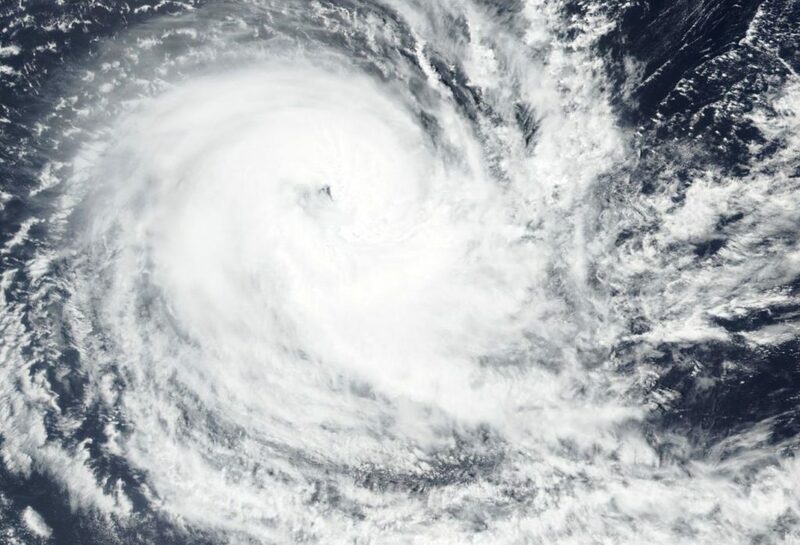 Tropical Cyclone Kenanga was at hurricane-force when NASA-NOAA’s Suomi NPP satellite grabbed a visible image of the storm in the Southern Indian Ocean on Dec. 18. On Dec. 18, the Visible Infrared Imaging Radiometer Suite (VIIRS) instrument aboard NASA-NOAA’s Suomi NPP satellite captured visible image of Tropical Cyclone Kenanga in the Southern Indian Ocean. The image showed the eye was covered by high clouds and was surrounded by bands of powerful thunderstorms. The image appeared like a backwards comma, with a large, thick band of thunderstorms extending from the southern quadrant to the east. At 10 a.m. EST (1500 UTC) the eye of Tropical Cyclone Kenanga was located near latitude 14.8 degrees south and longitude 83.7 degrees east. That’s about 805 miles southeast of Diego Garcia. Kenanga was moving southwest. Maximum sustained winds were near 90 knots (103.6 mph/166.7 kph) and Kenanga is expected to strengthen slightly before embarking on a weakening trend on Dec. 20. 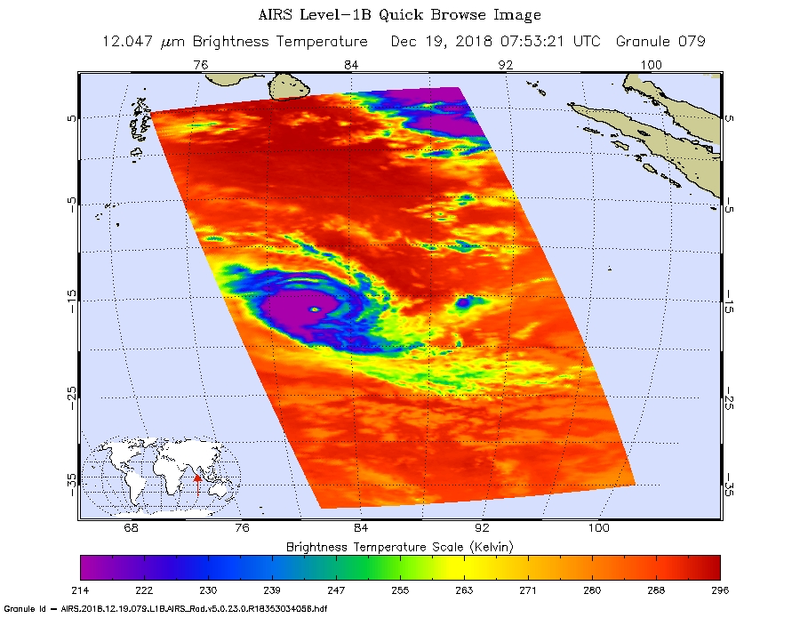 On December 16 and 17, NASA’s GPM core observatory satellite and NASA’s Aqua satellite, respectively, passed over the Southern Indian Ocean and captured rainfall and temperature data on Tropical Cyclone Kenanga. Kenanga formed on Dec. 15 about 1,116 miles east of Diego Garcia, and strengthened into a tropical storm. When the Global Precipitation Measurement mission or GPM core satellite passed overhead, the rainfall rates it gathered were derived from the satellite’s Microwave Imager (GMI) instrument. GPM provided a close-up analysis of rainfall around tropical cyclone Kenanga. Data from GPM’s microwave Imager (GMI) and Dual-Frequency Precipitation Radar (DPR) were used in this analysis. DPR found that a powerful storm northeast of Kenanga’s center of circulation was dropping rain at a rate of over 119 mm (4.7 inches) per hour. At NASA’s Goddard Space Flight Center in Greenbelt, Maryland, imagery and animations were created using GPM data. 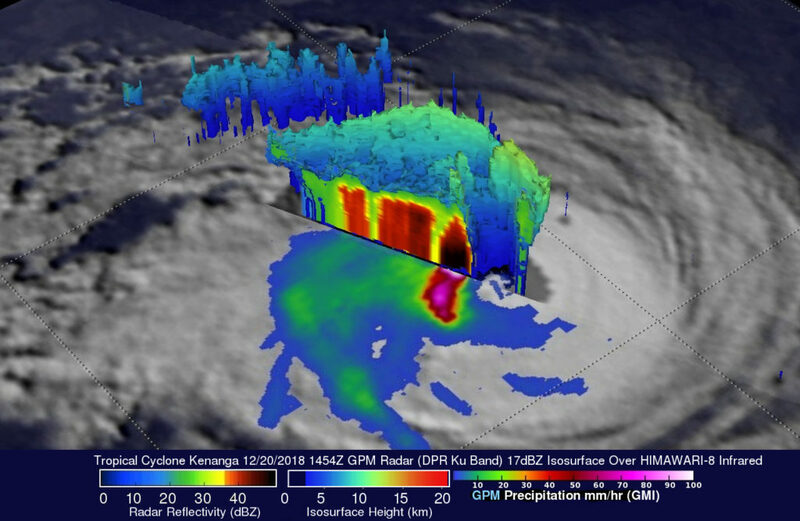 A 3-D animation used GPM’s radar to show the structure of precipitation within tropical Cyclone Kenanga. The simulated flyby around Kenanga showed storm tops that were reaching heights above 13.5 km (8.4 miles). GPM is a joint mission between NASA and the Japanese space agency JAXA. On Dec. 17 at 10 a.m. EST (1500 UTC), maximum sustained winds were near 60 knots. Kenanga was centered near 12.8 degrees south latitude and 86.0 degrees east longitude, approximately 885 nautical miles east-southeast of Diego Garcia. Kenanga has tracked west-southwestward. JTWC forecasters expect Kenanga to continue strengthening for the next two days and then conditions will deteriorate. After three days the storm is forecast to begin weakening as it interacts with cooler, drier air.